The ultimate kitchen accessory, for dog-lovers everywhere. Made from white high impact plastic, dog-end attaches easily to tiles, walls, cupboards, doors and fridges. Mounting instructions included.. The original cloth holder from slam, easy to look after, does not require taking for walks, cheap to feed, does not smell, won't shed hair everywhere, gets on well with cats, well - just ignores them really, and you can also use it to hold your tea towel..
Should the day come when, after a long and happy life, it is time for your faithful dog-end to make that final journey to the great kennel in the sky you will be pleased to know that his earthly remains (being made from the same stuff as yoghurt pots) can be fully recycled at your local recycling centre. "Great product, which was very humorous. Well recommended. 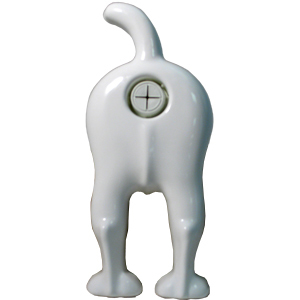 "The dog end towel holder has become a favourite amoung our group of friends as a gift! It's funny, practical and bound to never get your Mrs's approval - in other words perfect! The plastic is durable and easy to clean, whether its set up in the kitchen or the workshop!" "I was very pleased with my dogs bum and the way it consumed my untidy dish cloths, however he keeps leaping from the wall, the guys that make this need to get the sticky pad right before sending out the product as not everyone wants to screw it to the wall. I'd probably get more as stocking fillers if it worked although it might look a bit daft with stockings on." "This item is literally the DBs! The only problem is that I don't want to remove it from its backing card. Why? Because printed immediately below the dog's dangly bits is 'Mounting instructions underneath.'"